“During the last world war, I attended the Gregorian Pontifical University of Rome. I used to spend my summer holidays in San Giovanni Rotondo, close to my spiritual director, Padre Pio. It was the summer of 1942. Naturally we spoke about the war everyday, particularly of the military victories of Germany on all the battlefronts. I remember that one morning at the friary, I read in the newspaper that the German troops were approaching Moscow. I saw in that news flash, the end of the war, with Germany’s final victory. I met Padre Pio in the hallway and said to him, Padre, the war is over, Germany has won! Who said so? Padre Pio asked. Padre, the newspaper! I answered. Padre Pio said, Listen to me, Germany, this time, will lose the war and worse than last time! Just remember that! But Padre, I said, The Germans are already approaching Moscow! Just remember what I told you, he repeated. I insisted, But if Germany loses the war, it means that Italy will lose too! He answered firmly, Well, we will have to see if we finish the war together! These words of his were totally obscure to me at the time, given that Italy and Germany were allies. The following year, Padre Pio’s words became clear after the armistice with England and America on September 8, 1943 and with Italy declaring war on Germany. Another day, in the friary hallway, Padre Pio said to me, Italy will lose the war out of the mercy of God, not because of His justice. During World War II, hundreds of American soldiers who were stationed at military bases in Italy discovered Padre Pio, and San Giovanni Rotondo became a popular place of pilgrimage. 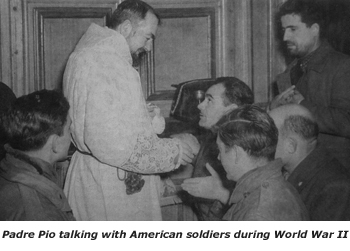 Padre Pio was always delighted to greet the American soldiers. His presence had a profound impact on the military personnel and many rediscovered their faith through their contact with him. It seemed that Padre Pio knew only one English word, Okay. One visitor observed that although Padre Pio did not speak English, he nonetheless seemed to understand the Americans when they spoke to him. In 1945, when World War II was finally over and American and British soldiers returned to their homes, they told their friends and family about Padre Pio and a growing flood of pilgrims from all over the world poured into San Giovanni Rotondo. U.S. Lieutenant Doyle Stickel wrote the following letter to his mother describing his visit to San Giovanni Rotondo during World War II. I really had a privilege last Sunday. I saw a miracle! Really, I did. I had heard of Padre Pio and so I took a group with me. It was a very rough and dusty trip, but well worth it. We went to Father Pio’s Mass and I was directly on the altar steps, as close as though serving Mass. Father Pio is the most devout priest I have ever seen at the altar. It took one hour and 45 minutes for the low Mass. You could see that he was close to God, talking to God. His eyes were half closed, his face twitched in agony, sweat gathered on his brow and tears flowed from his eyes at the consecration. I noticed then that the wounds of his hands were moist, that fresh blood was staining his fingers and the sides of his hands. Believe me, Mom, it was all there! The saintly Father Pio, in his agonized face and his torn hands, brought you to that original sacrifice at Calvary. Everyone’s eyes were on him and the Sacred Host as it was elevated. After the Mass was over, I, and several other soldiers, went into the sacristy. I knelt and kissed Father Pio’s wounded hand. Father Pio rested his hand on my head and blessed me. I was overcome with emotion. I went out of the church a much shaken young officer, but very much stronger in my faith. I later returned and spoke to Father Pio. He had taken off his vestments and was clothed in the brown robe of a Capuchin monk. On his feet he wore soft slippers instead of the sandals of the Order. He limps from the pain of the wounds in his feet. I asked him if he would say a Mass for my family. He said he would be very glad to do so. He patted me on the shoulder and told me I was a good boy and would be home with my family soon. I have never met a more holy, devout man. For I consider that the sufferings of this present time are not worthy to be compared with the glory which shall be revealed to us. Bob Coble was stationed with the 15th Air Corps in Foggia, Italy in 1944. A number of the service men from his company went up almost every Sunday to see Padre Pio and some assisted at his Mass. They encouraged Bob to go with them and he finally decided to join them. Bob said, I went and saw Padre Pio and I knew that I had seen something real but with my upbringing, I saw no reason to change. Only one thing remained in my memory and remains in my memory today. I remember his hands, the wounds on them and the lacy cuffs that partially covered them. That image, as I said, remains today. After Bob came back to the U.S. he became caught up in the activities of his busy life. The years sped quickly by. One year he received a Christmas card from a friend who told him about a book on Padre Pio and encouraged him to read it. The thoughts of his own encounter with Padre Pio came rushing back as he read the book. The experience had never really left him, it had only been pushed aside. As a result of reading the book, Bob started to attend Mass. He became a Catholic in 1988, 44 years after meeting Padre Pio. This is the victory that overcomes the world, our faith. Father John D. St. John, a Jesuit priest and army air force chaplain made nine trips to San Giovanni Rotondo during World War II to see Padre Pio. He often invited the soldiers to go with him and he usually brought with him between fifty and one hundred military personnel. On one visit, Fr. St. John took two soldiers and one army nurse. Fr. St. John said, I made no appointment with Padre Pio. I met the little brother at the door who looked like one of Snow White’s Dwarfs (Father Gerardo) and asked for Padre Pio, who came down in a few minutes and gave me the Roman embrace, kissing both my cheeks. When he was introduced to the people I brought, he became very cold. He had nothing to say to them. I told them to wait outside. I said, Che passa, Padre? He replied, Those people are sinful. He knew nothing about their background, but I knew that what he said was true, as I knew some of the sinful events in their lives. On the way back home, Fr. St. John asked his companions what they thought about Padre Pio. One said Father, that man has done something to me. I can’t explain it. There was silence all the way back to the base. Because of this incident as well as others of a similar nature, Fr. St. John became convinced that God had given Padre Pio many special gifts for his ministry to souls and in this particular case, the gift of reading hearts. The light is with you for a little longer. Walk while you have the light so that the darkness may not overtake you. “One time we left early in the morning for San Giovanni Rotondo where we were to visit with Padre Pio. As always we drove the jeep to the rear of the Friary. We had to drive the jeep into the barn and park it next to several donkeys. We attended Mass in the very crowded church. Never did I figure out how all of the people came to San Giovanni Rotondo to see Padre Pio. They came from everywhere even though a war was on and there was no transportation. Many people, I think, had to walk and hitchhike. Regarding the Mass, Mario said, It was a Mass that I could not describe. It was so beautiful. The room was filled with a perfume that came from Padre Pio’s wounds. The only words that came forth from my mouth as I knelt watching a living saint celebrate the Holy Mass were, My Lord and my God. After Mass, a friar took us to the dining room where we had breakfast. Padre Pio did not come to breakfast. He went straight to the confessional where hundreds of people were already standing in line. When we went with the friars into the dining room for lunch we observed that Padre Pio ate nothing. He just pushed food around on his plate as he talked to us and to the others present. And this is how we know that He remains in us; from the Spirit that He gave us. We are fervent Catholics, and our family has been very devoted to Padre Pio since the first time we heard of him. The following event happened on November 6, 1943 when World War II was in full swing. We lived in Florence and our surname, Forti in Tuscany and also in Florence, is a Jewish name. Even so, our ancestors have never been Jewish. The morning of November 6, 1943, four armed SS Germans rang our doorbell and accused us of being Jewish (my mother, my sister and I). They would have dragged us to who knows what terrible end, because the truck was already at our front door. I must go back to the beginning of the war. We should have left our house because the zone we lived in was dangerous. I had taken a picture of Padre Pio and attached it to the door. I said, Padre Pio, we are staying here. I entrust our lives, our house, our belongings to you. We stayed there peacefully, even during bombardments. That morning on November 6, 1943, the four SS Germans who wanted to remove us, not convinced that we were not Jewish, tried to penetrate into the house. No sooner had the first soldier, armed with a machine gun, put his foot inside the house, than the photograph of Padre Pio flew to our feet. Padre Pio’s face was upward and it brushed my foot lightly, like a butterfly. The soldier looked down at the photo of Padre Pio. He touched his forehead in the military salute and said, Excuse us and left with the others. Downstairs on the street, the poor Jewish people who were already gathered in the truck were crying with fright. What a danger we had escaped! My family and I attribute our safety to the miraculous intervention of Padre Pio. Though I walk in the midst of trouble, You will preserve me; You will stretch out Your hand against the wrath of my enemies and Your right hand will save me. A note from the editors: We met Ray Ewen enroute to Rome to attend the canonization of Padre Pio. He was one of the pilgrims who traveled with our group. Ray had the good fortune to meet Padre Pio in 1944 and he was gracious enough to share his story with us. Ray Ewen, a veteran of the Army Air Force, was stationed in Cerignola, Italy during World War II. He and some of the other soldiers had heard about Padre Pio, so when curiosity got the better of them, they decided to make a trip to the monastery. The first person they met when they arrived was Mary Pyle, the American woman who was Pio’s assistant for over forty years. She acted as translator between the soldiers and Padre Pio and became a very close friend to Ray. The first time Ray saw Padre Pio, he could tell by the expression on his face and by his painful gait that he was suffering greatly from the wounds in his feet. Ray was able to attend Padre Pio’s 5 a.m. Mass twelve times. He and the other service men were allowed to sit right up in the sanctuary. During the Mass, Ray could see Padre Pio crying and wiping tears from his eyes. At times they seemed to be tears of joy and at other times, tears of sorrow. Six or seven times during the Mass, Padre Pio’s expression would change. During the consecration, Padre Pio became completely still for about ten minutes, as if he were in another world. His thanksgiving after the Mass was never less than forty-five minutes. On occasion, Ray was able to visit with Padre Pio in the friary garden while he was having his lunch. Ray used to bring Padre Pio American beer, which he enjoyed very much. He would laugh and tell Ray that the beer was much better than the vegetable soup that was often his mid-day meal at the monastery. As a confessor, Padre Pio, sometimes used his own form of shock treatment when the situation demanded it. This was often just the kind of wake up call that an individual needed for conversion. Once Ray was standing inside the church and heard Padre Pio order a man out of the confessional. All of those who were waiting in line to go to confession also witnessed this and lost their courage and left. Padre Pio felt a great sense of responsibility as a confessor and he insisted that a confession also be a conversion. The conditions that he required of every penitent were contrition and a firm purpose of amendment. Padre Pio received permission from the Archbishop to have a Midnight Mass on Christmas Eve for the American G.I.’s. Ray said that Mass was a never to be forgotten experience. The small friary chapel of Our Lady of Grace was beautifully lit with candles. Padre Pio held a small statue of the Infant Jesus in his arms and processed through the old 16th century church during the solemn Mass. In the course of his visits to San Giovanni Rotondo, Ray became very good friends with Padre Pio’s father, Grazio Forgione, even sharing Thanksgiving dinner with him on one occasion. Grazio, filled with fatherly pride, loved to share many precious stories about his famous son. Ray had a brother who was also in the military and he heard that his brother had been wounded and was in a hospital somewhere in France. Ray decided to go in search of him but Padre Pio told him not to. He told Ray that his brother was, in fact, safe and was already on his way home. These words proved to be true. Ray described Padre Pio as a humble man, friendly and congenial who liked to laugh and tell funny stories. And while his holiness was so apparent, so obvious to everyone, Padre Pio was, in his own way, a simple man, an ordinary man. To Ray, Padre Pio’s dark and penetrating eyes were his most striking characteristic. He said, Looking into the exceeding depth of his eyes was an indescribable experience. It was like entering heaven. Today, Ray Ewen, who lives in New York, is 86 years old. Ray said that in his lifetime he has come in contact with many priests as well as military chaplains but Padre Pio was unique. Ray said, Padre Pio was the holiest man I have ever met in my life. He is my living saint. I always hoped and prayed I would live long enough to see him canonized. That dream came true for Ray Ewen on June 16, 2002. You are no longer strangers and foreigners, but fellow citizens with the saints.